That basically meant that the comic creators had a hell of a time trying to fit the established mythology of the show into the comic series and pretty much gave up on even trying to. Instead, they tried to create their own conspiracy mythology (The "Aquarius" conspiracy) tying together the stories in the first year or so of the comic series. But even that became difficult because of the iron grip the T.V. production company had on the comics. . .it eventually led to the departure of the original creative team and an erratic shipping schedule, but more on THAT later. Enough background for now. I just find the behind the scenes drama of this comic series to be interesting. Let's go ahead and jump into the first 9 issues of The X-Files. . .
F.B.I. Agents Scully and Mulder get caught up in a government conspiracy as they investigate the mysterious death of a man who claims to have been part of a team that has stolen the Fatima Prophecy from The Vatican. Overall, not a bad first issue. The story is engaging and hints at ties to a larger conspiracy to come. Unfortunately, the art is a bit dodgy and doesn't capture the likeness of the show's stars well at all. Also, this is NOT a good introduction to The X-Files as it is assumed the reader already is a fan of the T.V. Show and knows about the past history of the characters (the comic series takes place during season 2 of the show). Agents Scully and Mulder investigate the deaths of witnesses to a 1948 U.F.O. crash and uncover a secret government experiment in memory and mind control. The story in this issue was pretty good, with plenty of twists to match the theme that what seems real might not be the truth as government ties to events are slowly revealed. The art shows a bit of improvement from the first issue, but Adlard still fails to capture the likeness of the show's stars. In the aftermath of the secret government experiment uncovered in last issue, Agent Mulder is contacted by one of the men behind the experiment and is offered a chance to know the truth about his missing sister in exchange for Mulder's help in escaping the conspiracy. The story in this issue was really quite interesting as the hints of conspiracy in previous issues begin to open wider. Unfortunately, there's two main problems with this issue: The first is that it heavily relies on characters and continuity from the T.V. show (The Lone Gunmen appear without introduction or explanation, for example) and the second is that the art takes a downward turn. . .especially with Scully. At one point the conspirator blackmailing Mulder takes her hostage and she looks like a teenage blonde boy. I couldn't even tell it was Scully until the script verbalized it. 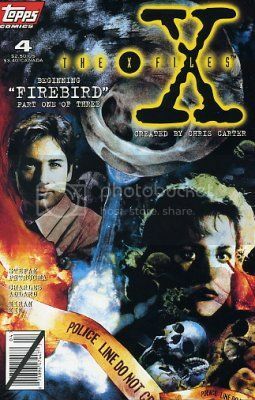 During an investigation of a Russian scientists' bones found in New Mexico and somehow aged to appear over 15,000 years old, Scully and Mulder uncover a secret laboratory where an ancient alien being has been captured by the government. I'm a bit cold on the first part of this three issue story so far. It has to do with a giant alien that apparently was the cause of the mysterious Tunguska explosion of 1908, but the writer has to jump through some hoops to bring a giant squid-like alien from Siberia to New Mexico that strains the suspension of comic book belief a bit. It's just not nearly as well-written as the previous 3 issues. Another problem is that the art in this issue is probably the worst yet. Once again, Adlard completely fails to capture the slightest resemblance to Gillian Anderson's Scully. . .although in a very nice double page spread of the secret laboratory, I can see the artist he will eventually become on The Walking Dead. 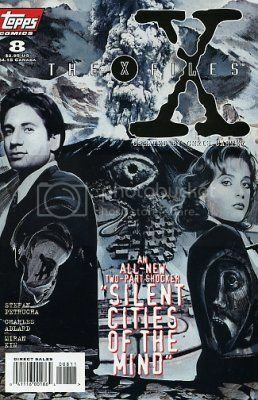 Scully and Mulder's discovery of a hidden laboratory in the New Mexico desert containing a giant alien being leads to catastrophe as the alien escapes and threatens a nearby city with nuclear annihilation while Mulder and Scully are hounded by secret government operatives. I can appreciate that the writer was trying to expand the X-Files mythos, but the T.V. show was more about the strange things hidden just beyond the knowledge of normal people. . .NOT about a giant radiation-emitting space squid threatening millions of lives. This story has none of the creepy subtlety of the best X-Files episodes. It's basically a comic book-style giant monster attack with barely-acceptable art. As Mulder meets the figures behind the "Aquarius" conspiracy, Scully tries to reunite an elderly Russian tribesman and a mysterious crystal egg with the giant alien being threatening millions of lives over New Mexico. All I can say about the conclusion to this three issue story is. . .Thank God it's over. There are just so many holes and leaps of logic and ex machinas in this issue that I don't even know where to start. The story comes to an end, but in an extremely clunky and confused fashion. I've got 36 more issues to read and review. I damn sure hope they aren't as bad or worse than this. I can't believe the steep decline in quality in just SIX issues! As Mulder and Scully investigate a serial killer that somehow knows the future, they discover that they are both targets. After the crapfest that was "Firebird", this extremely average issue seems more welcome than it should be. It's basically a pretty good copy of the T.V. show's "one and done" throwaway episodes. So not bad, but not great, either. 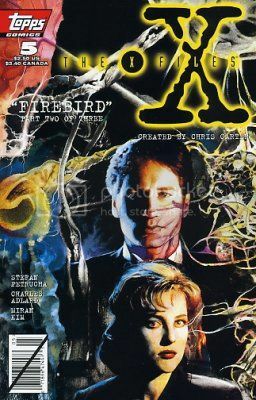 In the first part of a story that combines cannibalism, Atlantis, an ancient Aztec city in Alaska, and one of the lost tribes of Israel, Scully and Mulder are trapped in the Alaskan wilderness after a plane crash, with Mulder at the mercy of a mad cannibalistic scientist. This issue throws a LOT of stuff at the wall. Unfortunately, none of it really sticks. As a result, it's a bit of an unfocused mess. At least the art is showing some improvement. I guess earlier in his career Adlard was a bit uneven. . . Deep inside an Aztec city hidden in Alaska, a mad scientist consumes the brains of a mummy and gains forgotten knowledge of the extraterrestrial origins of the Aztecs while operatives of the "Aquarius" conspiracy close in, hunting a crystal helmet hidden in the city. This series has gone from a decent approximation of the same conspiracy-tinged exploration of unsolved mysteries on the X-Files T.V. show to a Bat$#it insane fever dream. . .and not in a good way. I mean in a cluttered, almost nonsense way. 32 more regular issues plus 2 annuals to go. . .God help me. First off I definitely need to point out that, no matter what else might be said about this X-Files run, the covers on each and every issue from first to last are remarkable! To me, there's not a bad one in the bunch. They are twisted, dark, and eerie. . .perfectly fitting what the X-Files is SUPPOSED to be. Unfortunately. . .the comics themselves, not so much. And as a huge X-Files fan, that's a damn shame. The stories seem half-baked and the art is extremely shaky. When I saw that The Walking Dead's Charlie Adlard (sorry. . .CHARLES Adlard in 1995) was on art here, I had high hopes, but Adlard seems to be incapable of capturing the likeness of either or the show's stars. . .and in a licensed property, that would seem to be about the MINIMUM requirement for the art department. But at least with the art, I can see moments that shine through and show the artist Adlard will become. The writing, on the other hand, wavers from "pretty good" to "What the F#CK is THIS $#it?" It's almost like the bare minimum effort was put into the writing. I realize that the writer of this comic had his hands tied in many ways, but even given that, these first few issues were extremely uneven in quality and never really rose to the level of the original source material. More X-Files. 32 more issues (plus 2 annuals) to go. Please, God. . .let it become better. At least don't make it worse.